Follow our story and learn how we train perfect puppies*! Follow us and learn how to train a perfect puppy*! My name is Colby, I created the Puppy In Training blog to tell our story about raising and training guide and service dog puppies and to help you train your puppy. Whether you’re just thinking about picking up your first puppy or you’re a grizzled veteran of the dreaded puppy vampire teeth this blog will help you on your way to a well-behaved, perfect practically perfect puppy (just like Mary Poppins: “Practically Perfect In Every Way”). This page contains information to help you get up to speed quickly and start working on some of the basics of raising and training a puppy. QUICK TIP: No matter if you’re about to bring home a puppy or already have one tearing up your house you’ll want to take a look at our new puppy checklist. We include anything and everything we could think of that you need for your new puppy. If you’ve reached our site then you are probably in some way, shape, or form associated with/in love with/frustrated with/enamored with a puppy (or future puppy). I’m taking an wild educated guess as to who you are to help you find the information you need to make your puppy raising journey as pleasant as possible. 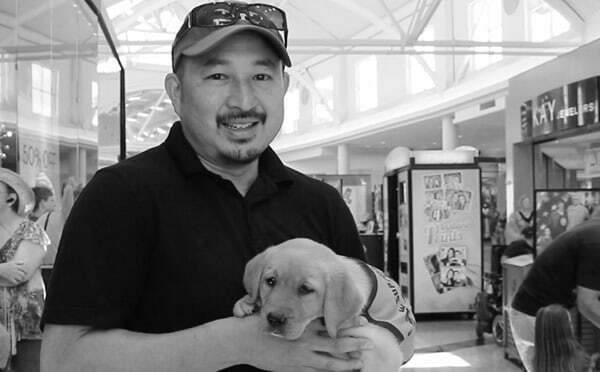 Puppy Raiser: You are a puppy raiser (or future puppy raiser) for one of the many guide or service dog schools around the globe. If this is you then you might be most interested in our Puppy In Training TV series, a YouTube TV show that documents our journey with our third Guide Dog puppy in training, Dublin. Check out Puppy In Training TV! Pre-Puppy: You’re still in the decision making process: Should you get a puppy? What kind of puppy should you get? Lets start you off with 5 tips you can use when bringing home a new puppy. Post-Puppy: The bliss pain of puppyhood! Thank god puppies are cute adorable creatures because after the initial bliss of bringing home your puppy you realize this is going to be no easy chore. Dog Lover: The majority of the site revolves around puppies and our journey raising and training guide dog puppies. However, it’s been many years since we started writing to the blog. Stetson has considered a career as a therapy dog and Linus wanted to get certified as a K9 Nosework dog. So, even if you’re puppy is no longer a puppy there is a spot here for all dog lovers. Read more about K9 Nosework and/or Therapy Dogs. Pet Product Advertiser: If you’re hoping to advertise one of your products on our site then congratulations you’ve done more than 95% of pet product advertisers. We wrote this blog post specifically for you: A Post For Pet Product Advertisers. Well, not really…but we do keep an active presence on some of the most popular social media channels. YouTube – up to this point with posted Puppy In Training TV videos and Product Review videos on our YouTube Channel. Check it out and subscribe! Pinterest – we love visual search and enjoy collecting and pinning our favorite content. Facebook – we have an active page on Facebook with over 70K “likes”. If you love cute puppy pictures this is where we post most of our favorite puppy pics from our various outings and events. SmartLove Snuggle Puppy – a plush puppy with heat pad and beating heart. A great toy for new puppies. Rocco & Roxie Stain and Odor Eliminator – if you have potty accidents make sure you get an enzymatic cleaner to completely remove potty odors. Puppies for Dummies – a great introductory puppy book. It’ll give you a good foundation to start when raising and training your puppy. Dog Crate – Midwest Life Stages – we crate train all of our puppies and we’ve used the same Midwest crate for all of our puppies for 15 years. Grannicks Bitter Apple Spray – does your puppy bite, chew, destroy things? Bitter Apple Spray can help deter these unwanted behaviors. I Still Haven’t Found What I’m Looking For? Okay U2…if you’re still confused, you still don’t have a perfect puppy, and you still can’t find the answer to your puppy problems please leave us a comment below and we’ll do our best to answer your question. Four mos ago I adopted a puppy mill dog that is part Maltese and maybe Shihzu. Our vet thinks she’s arouns 5 yrs but she’s never had puppies. She has made significant progress although she’s still quite skittish at times. I have started with housetraining and she does not empty bladder. When outside she will often do 3 short pees in a 15 min period. Within 20 min of coming back inside she is peeing again. Because of this I’ve kept pads on the floor which she uses. I’m wondering if this is confusing her with also going outside. She has no signs of bladder infection so this is not the problem. I have a question about an adult dog – I hope you don’t mind. My 5 year old Siberian Husky has a habit of peeing in the house when he is excited. It typically happens when we have visitors to the house, usually people he knows and doesn’t see very often. It is usually the same people each time no matter what we do to try and prevent it. Sometimes he even pees when my husband comes home in the evening. We’ve tried putting him outside and doing the usual “go pee”. He will go outside and pee and then come right in and pee on the lucky individual. I know he realizes he isn’t supposed to do it because he always kind of ducks his head down. Do you have any suggestions? Thank you! When we have dogs that pee when they get excited we mostly try to ignore them when we first get home and then calmly greet them once they are calm. We have a 7 month old Bichon Maltese mix puppy that we bought from what we thought was a reputable breeder. Anyway we’ve had her for almost 4 months now and potty training is going very badly. We do everything that is recommended. We use a crate. We reward her after she does her business outside. We have her on a regular feeding schedule. She still routinely pees and poops inside including in her crate. She is showing no improvement. We have had many dogs and trained lots of puppies in the past. But I believe this dog may simply be untrainable. This just doesn’t seem normal and it is a major source of stress in our family. I believe we will probably have to give the dog away. Any advice you could give for this type of situation? At what age will a female come into heat? You should check with your vet. We’ve only had a couple females, a Labrador Retriever and a Golden Retriever through their first heat cycle and as I recall they both happened around 10 months of age. Hi, I just got a 4month old yorkie puppy 3 weeks ago. I’ve had dogs all my life and have always been patient with training, but I’ve always had at least 2 dogs so I’ve no experience with dealing with what i can only interpret as isolation distress – from what I’ve read in other places. I’m not working right now so Im mostly home with him which has been great for potty training, but as soon as im out of sight for a few seconds he’ll bark/cry/howl his head off. And I don’t know if peeing/pooping out of anxiety or anger is a thing but i think he does that too. I’ve tried leaving him by himself in my bedroom where he has proven he’ll go on his pad 100% of the time if im in there with him only to find he peed and sometimes pooped (ultra tiny) a right outside of the pad. And this can happen in as little as 2 minutes while i get a glass of water. Hi, I rescued a puppy (breed unknown), that is now 4 months old. She is in the crate when we are not home and over night. I come home at lunch and walk her. My son then takes her out when he gets home from school and she is out in the house the rest of the day. She never has accidents in the crate. However, she pees in house anywhere from 15 to 30 times a day. We take her outside at least every 20 minutes, she has done this since we got her at 9 weeks old. Its exhausting. She also pees 3 or more times when we take her out. I have taken her to the vet 3 times. I even went to a second vet to get another opinion and there is no sign of a uti. The last vet went ahead and put her on an antibiotic and it didn’t help at all. Its extremely exhausting and I dont know what to do at this point. Please help if anyone has had a similar experience.